TP stands for Tropopause. It is an isothermal layer and/or inversion in the upper troposphere. This warming is produced by the absorption of shortwave radiation by ozone. The tropopause is located near the bottom of the "ozone layer". 2. How is the TP located? On a Skew-T, the TP is given as a pressure level in millibars. In reference to the Skew-T parameters below, the TP is given a value of 117. This is 117 mb. 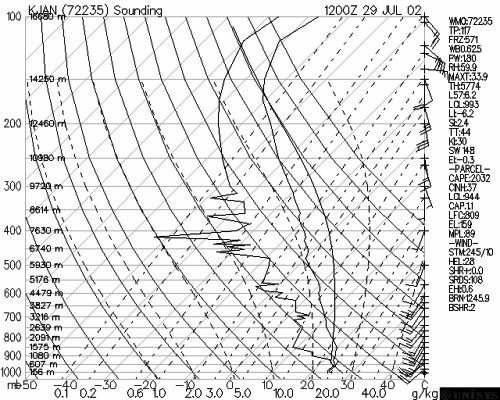 The level where the temperature sounding first becomes isothermal or becomes an inversion in the upper troposphere is denoted as the tropopause level. In actuality, the tropopause is much more of a transition zone than a particular pressure level plane. The tropopause represents an upper level barrier to convection since its very high stability decelerates updrafts rapidly as they move into this region. The TP is at a higher elevation and lower pressure level in the warm season as compared to the cool season. In the warm season the TP will be around 150 mb while in the cool season it will be closer to 250 mb and will also be more abrupt and thus easier to locate.